Kitchen luck. Sometimes I’ve totally got it. Other times, totally not. This week was iffy. For an anniversary dessert, I made a cherry clafouti. Definitely fun to say, very pretty to look at, but fun to eat? I dunno, it didn’t turn out like I had expected. Maybe I don’t like custard, but this was definitely too eggy for my tastes. Cornelius likened it to a cherry omlette, so despite my best efforts and a Julia Child recipe, I don’t think I’ll be making this again. 1. Mix the icing sugar with the cherries and kirsh. Set aside. 2. Blend together the milk, eggs, vanilla, sugar, salt and flour. Add the cherry mixture into a cast iron pan and then pour the rest of the batter over top. Bake at 350 degrees for about for about 45 minutes to an hour. When a knife inserted into the centre comes out clean, the clafouti is done. Later in the week, my kitchen luck was hitting high again. After spotting a Rebar: Modern Food Cookbook pancake recipe over at Eat Me Delicious, my breakfast mind was made up. So I grabbed my Rebar cookbook copy off my shelf and got to work. Of course, I didn’t have oranges so I substituted lemon zest and lemon juice and I used vanilla yogurt instead of plain, but breakfast worked out wonderfully. These pancakes were fluffy, lemony and incredible! Finally, kitchen luck was back on my side! 1. In a large bowl, mix together the first 5 ingredients. In a smaller bowl, whisk the eggs and add in the remaining ingredients. Add the wet to the dry and gently fold together. Let rest for 10 minutes. 2. Melt a bit of butter in your griddle or cast iron pan and add a small amount of batter. Cook until bubbles appear and the edges look dry. Flip the cakes over and cook for a few minutes more. 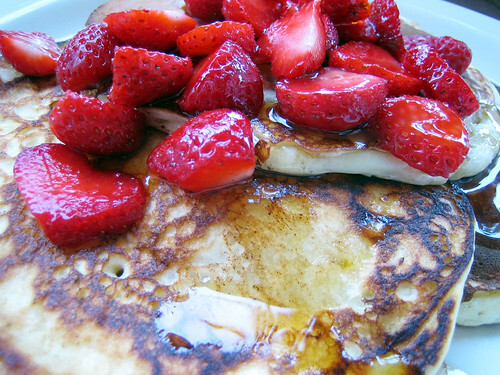 Serve with fresh strawberries and maple syrup. Yesterday I again played with my kitchen luck and got burned…literally. Earlier this week, we bought a little bbq for our balcony and we decided to fire it up for a little salmon dinner. Well, this salmon was a porker and ended up dripping so much fat that the fire got a bit out of control. Fear not, the fire department wasn’t called in, but it resulted in some pretty charred fish. However, once the charred skin was peeled back and the pretty pink flesh was revealed…oh my, so tasty! My salmon marinade was simple….juice and zest of 1 lime and 3 cloves of garlic. That’s it. Delicious. Later on, I decided to make the “world peace cookies” I saw over at Culinary in the Desert. 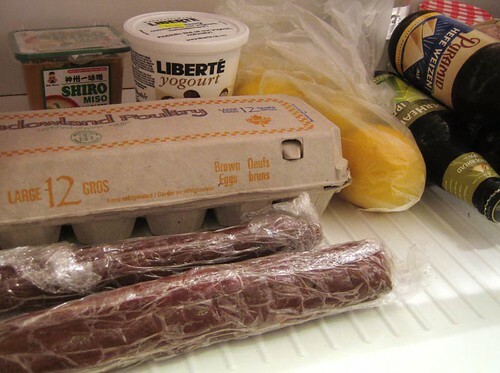 While I snickered at the name (what can I say, I’m jaded) and while Cornelius kept making bad jokes (“I think an 80’s hippy came up with the name….no, not 80 hippies…a hippy from the 1980’s!”), I freaked him out by leaving the brown logs nestled in the fridge. While the cookies were okay, there was a lot of work involved and by a lot of work I just mean rolling the dough into brown logs (which are great for freaking out guests) and waiting 3 hours before baking. Next time I have a craving for peace, I’ll stick to these double chocolate cookies instead. Lucky for vegans, you can easily sub Earth Balance margerine to either of these recipes and get good results. i made a blackberry clafouti last year that wasn’t too eggy tasting. More like a souffle. re: world peace cookies: they seemed like a lot of work for just a chocolate cookie to me too. I’ve tried to make clafouti twice before – failed both times. I’ve had clafouti at Clafouti in Toronto and was left feeling that clafouti is one of those desserts that a person thinks they should like but is really not that good. Have you ever made a pavlova? Pavlova is elegant and simple and a great way to eat fresh summer fruits. I had a similar problem with my first and only cherry clafouti. Cherry omelette about sums it. But the Korova cookies are definitely worth the effort (original name that Pierre Herme gave to the cookes now called ‘world peace’)–they are fabulously delicious. Some of the best recipes are discovered by faux pas and “mistakes.” The clafouti looks awesome but yeah, I can totally understand the eggy taste being off-putting. i’ve been meaning to make those worldpeace cookies since everyone’s been raving about them…but now i’m not so sure since i trust your judgment. hmmmmm! Rachel, mmmm, a blackberry souffle sounds good! And don’t even bother with the wpc…so not worth the hassle. Yay, Craig!! I’m glad yer a clafouti hater too. I feel so much better about myself now too 🙂 As for pavlova, I’m a devotee! I love it…it was the first dessert I made when C’s parents were over for the 1st time. Super impressive! Joanne, you got a job? Do tell! I hope you get a batch of pancakes to enjoy this long weekend!! Robina, it’s totally not worth the hassle. Next time I make those double chocolate chip cookies I linked too, I’m going to add some fleur du sel just to make ’em extra tasty. Forget about the wpc. Totally not worth it at all. I’ve had an eye on those pancakes ever since I saw them – your version with lemon is fantastic, too! Thanks Patricia, the lemon worked so well but I’d love to try the original version too. 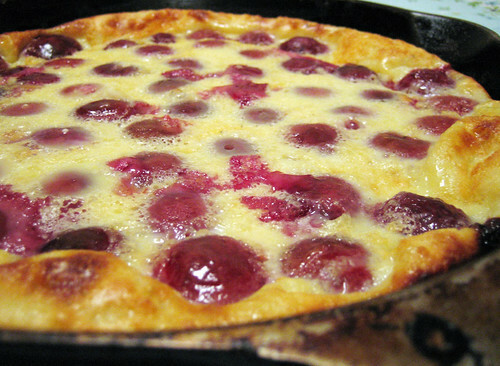 I also made clafouti that tasted like nasty eggy cherry omelette. It was early in my cooking adventures, but a second atempt rendered the same thing. And I second Craig’s idea to make pavlova… Nigella Lawson has a chocolate pavlova that is fantastic! We use Dagoba spicy chocolate powder, and it’s incredible! Good luck! dynagrrl, i’m glad i’m not alone with clafouti! i love pavlova and i’m sure a chocolate version would be to die for! another cherry clafouti dissenter here. it looked pretty, but was only edible with copious amounts of vanilla ice cream. oh well….at least i can cross it off my list of things to try! u mean sugarless plain yoghurt or the sweetened kind? Jade, I used sweetened vanilla yogurt, but the plain unsweetened yogurt would do fine as well.